Juan Soto was born on Sunday, October 25, 1998, in Santo Domingo, Distrito Nacional, Dominican Republic. Soto was 19 years old when he broke into the big leagues on May 15, 2018, with the Washington Nationals. 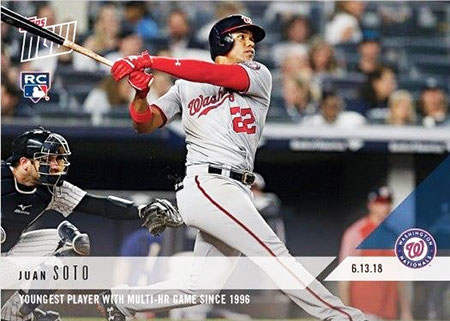 His biographical data, year-by-year hitting stats, fielding stats, pitching stats (where applicable), career totals, uniform numbers, salary data and miscellaneous items-of-interest are presented by Baseball Almanac on this comprehensive Juan Soto baseball stats page. Juan Soto hit two home runs in the same game, on June 13, 2018. He was 19 years, 231 days old, making him the fifth-youngest player in Major League history with a multi-homer game on their resume. Those who came before him were 4) Ken Griffey, Jr. (19 years, 226 days on July 5, 1989 & 19 years, 190 days on May 30, 1989 ); 3) Andruw Jones (19 years, 121 days on August 22, 1996 ); 2) Mel Ott (19 years 187 days on September 5, 1928 & 19 years, 77 days on May 18, 1928 ); 1) Danny Murphy (19 years, 35 days on September 27, 1961 ). Did you know that Juan Soto kinda hit a home run in his first at-bat? On May 15, 2018, Soto went 3-for-4 at the plate - all singles - with the Harrisburg Senators (Minor League Baseball). On that same day, the New York Yankees and Washington Nationals played a game that was suspended in the bottom of the 6th with the score 3-3, due to inclement weather. Soto was called up to the majors five days later, made his big league debut, pinch hit for Adrian Sanchez in the eighth frame, and struck out in his first Major League at-bat. Fast forward to June 18, 2018, the suspended game mentioned earlier, was completed, at Nationals Park. Soto once again pinch hit, this time for Matt Adams in the sixth frame, and this time Soto hit a home run. Major League Baseball games are not listed by the date they are completed, but rather the date they began, so Soto according to that date, homered on May 15, 2018, five days before he even made his big league debut!